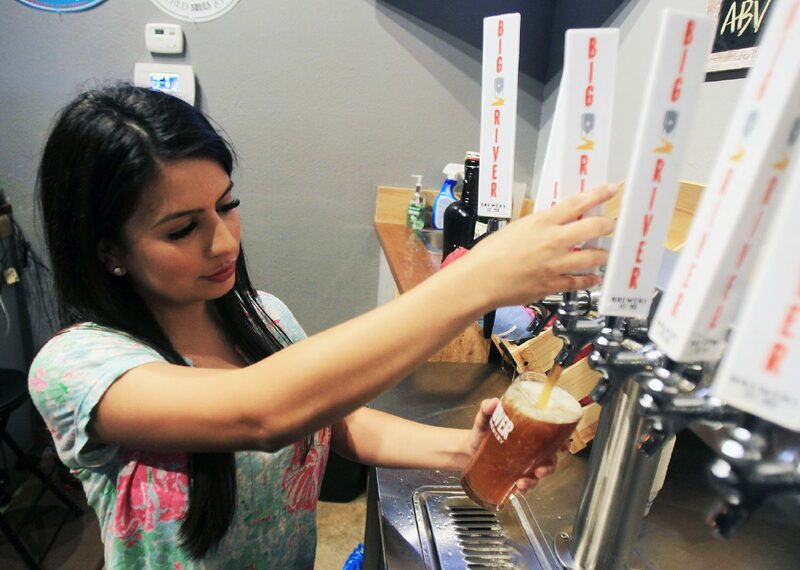 Clarissa Guerra pours a glass of cold beer at the Big River Brewery on Friday, April 6, 2018 in Pharr. A quarter mile off Interstate 69C on most days, retirees, college kids and everyone in between sit on barstools, watch sports and sip stout and India pale ales made in the backroom. A food truck, often a local one, parks out front. Before a year ago, this did not exist. Big River Brewery, the Valley’s first microbrewery, was a long time coming. The Rio Grande Valley was ready for this, according to founder Steve Padilla. It just took a while to untap it. Owners, Bertha Padilla and Steve Padilla pose at the Big River Brewery on Friday, April 6, 2018 in Pharr. The Big River Brewery on Friday, April 6, 2018 in Pharr. Eugene Huslid drinks a glass of cold beer at the Big River Brewery on Friday, April 6, 2018 in Pharr. 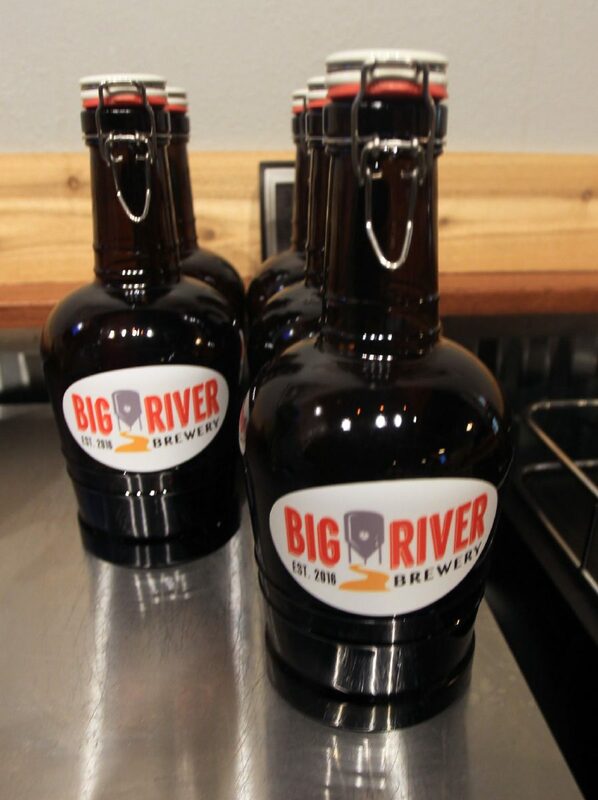 Growlers are used to take different beers home at the Big River Brewery on Friday, April 6, 2018 in Pharr. Saturday is National Beer Day. A week later, the brewery will celebrate its one year anniversary. The national holiday, some joked, will feature the 10th annual Brew-seum at the International Museum of Arts and Sciences. The event will feature an array of craft beer, which is defined by the Brewers Association as an annual production of 6 million barrels of beer or less, or less than 25 percent of the brewery being owned or controlled independently. 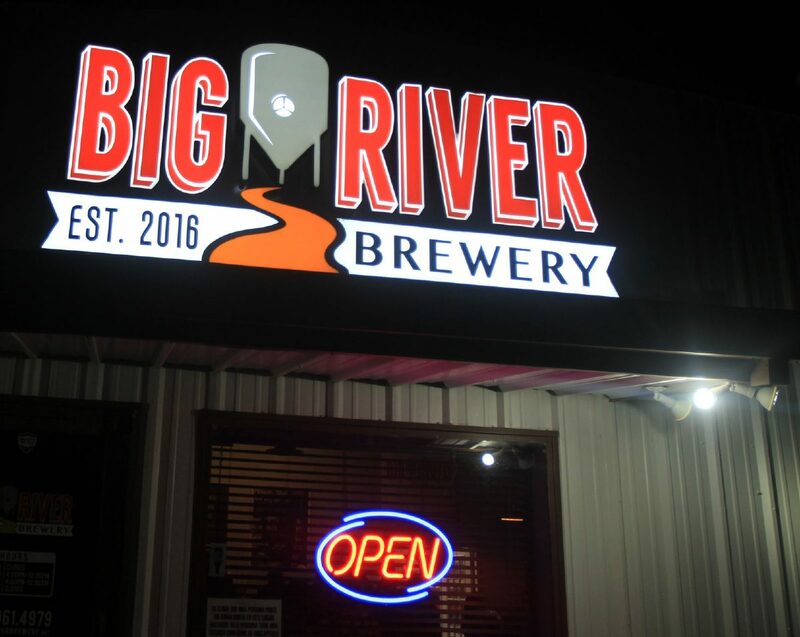 Beer at the Brew-seum will come from everywhere, including Big River and local brewer 5×5 Brewing Company. Another local maker will be having its own celebration. 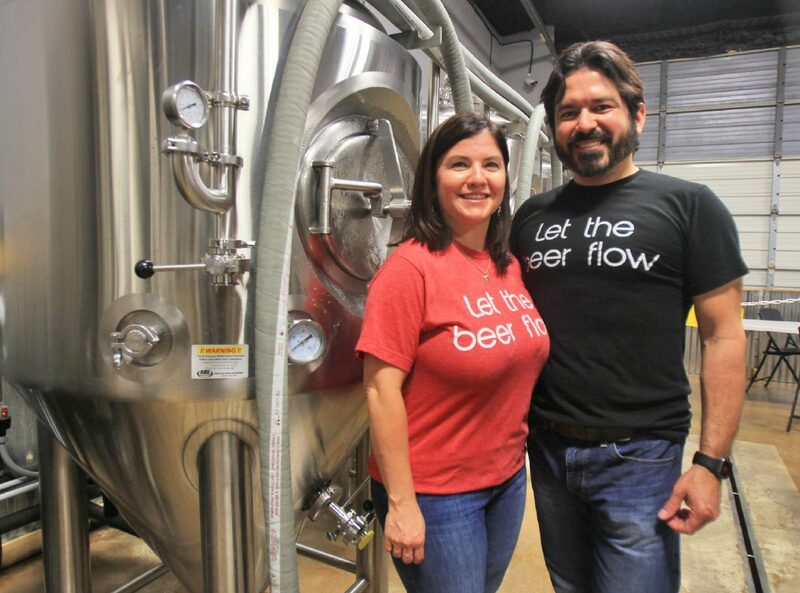 Rabble-Rouser Brewing Company works out of a business park warehouse in McAllen and has been in operation longer than Big River, but is locally referred to as a nanobrewery, or a scaled down version of a microbrewery. Rabble-Rouser, whose ownership declined to speak for this story, typically does not have its beer in local restaurants or bars, as Big River does. The 5×5 brewery, which will be a microbrewery that’ll feature on-premise consumption and hopes for distribution across the region, is not yet open but plans to do so in the coming months, according to co-founder George Rice. There are other breweries in the works, which speaks to the interest in the craft scene, Rice said, and is good for business. But locals weren’t the only ones to notice the craft beer interest in the Valley. Four Corners Brewing Company, the Dallas craft brewery, believed in South Texas, too. After building up a foundation in the Dallas market, the company wanted to expand, George Esquivel, a co-founder of the brewery, said. A logical step may have been one of the other Texas metropolises — Austin, Houston or San Antonio. But the brewery inked a deal with L&F Distributors, bypassed the sprawling cities and began distributing to the Valley, Esquivel said. With their “loteria vibe,” Esquivel said, the brewery wanted to test its brand outside the Dallas-Fort Worth metroplex. Esquivel knew there were craft beer drinkers in Austin, Houston and San Antonio. Padilla, the founder of Big River, said he didn’t anticipate the type of crowd that has flocked to his brewery. Esquivel has noticed the progression, too. Four Corners has even partnered with a Valley farm on a beer. It brewed a special release Saison-style beer in 2017 that used grapefruit from Bayview in Cameron County. But Esquivel acknowledged they could’ve done a better job brewing that beer. He hopes to do better. This story was updated to reflect that Rabble-Rouser Brewing Company is not participating in the Brew-seum event, but it is having its own event.